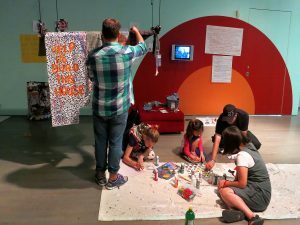 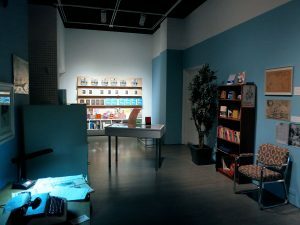 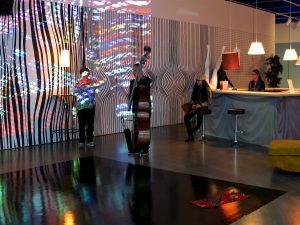 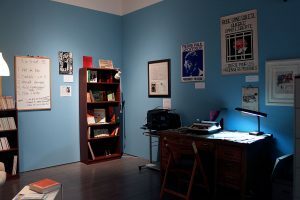 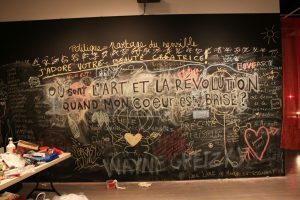 This collaborative project transformed an art gallery into an immersive environment exploring concepts of national belonging and inspired by artist collectives that made an impact on modernity in Quebec. 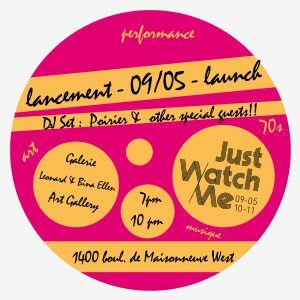 Just Watch Me was a large-scale site-specific project and event design at the Leonard & Bina Ellen Art Gallery in Montreal about the legacy of immigration in the 1970s in current concepts of neo-Quebec identity. 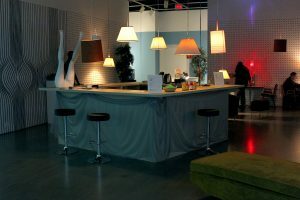 The project transformed a 3,600 sq. 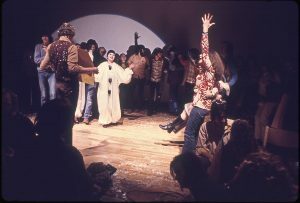 ft. gallery into a social club, which included a disco-bar, fair-trade café, stage, movie theatre, studios for artists-in-residence, library and theater stage. 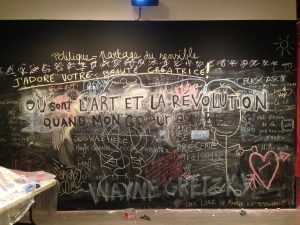 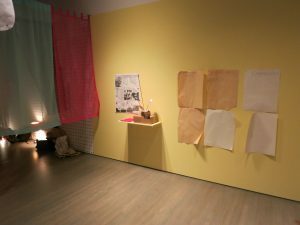 The site-specific installation targeted the students of this gallery university, as well as local neighbours of Montreal, and was the result of two years’ fieldwork, involving interviews and archive research in collaboration with three art historians about three art collectives from the 1970s that have marked modernity in Quebec: the Mousse Spacthèque, the Fusion des Arts inc. group, the Fondation du Théâtre d’Environnement Intégral and the periodicals Parti Pris and Liberté among others. 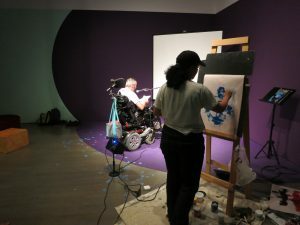 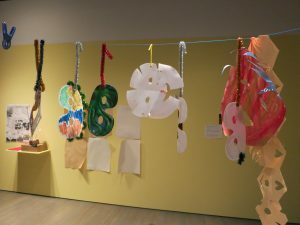 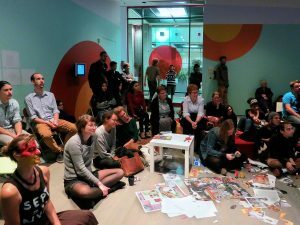 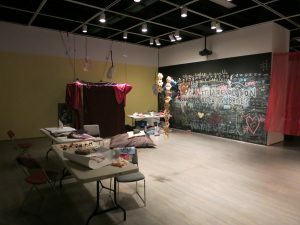 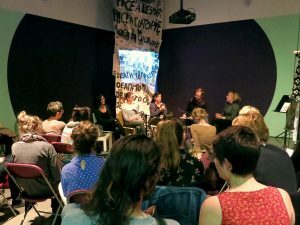 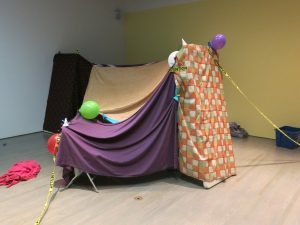 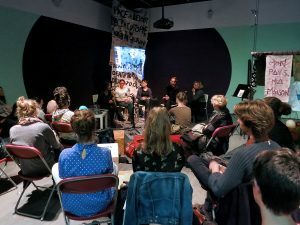 The whole event, which spread over five spaces and lasted a month, was made in collaboration with over 50 partners, from community organisations to activists. 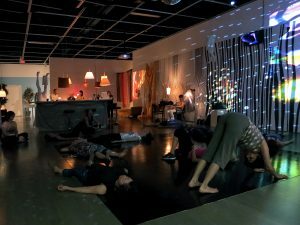 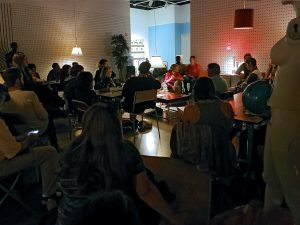 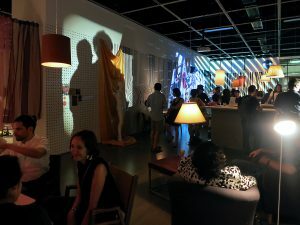 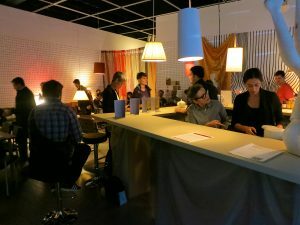 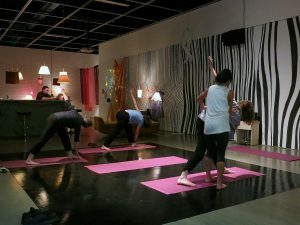 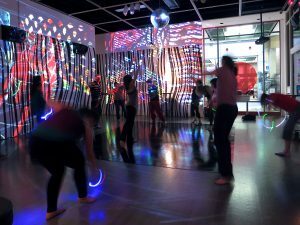 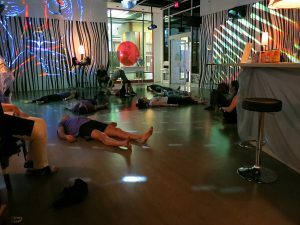 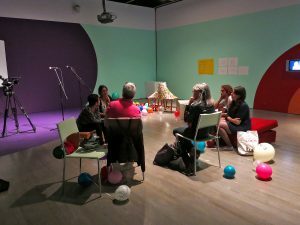 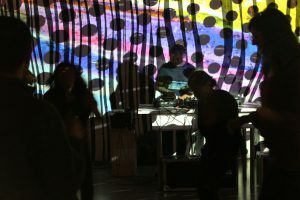 Numerous free daily activities and performative works, including video-making workshops, yoga, tai chi, GROOVE, panel discussions, screenings, and conversations, promoted immersive participation, discussion, and exchange on questions of identity in a festive environment. 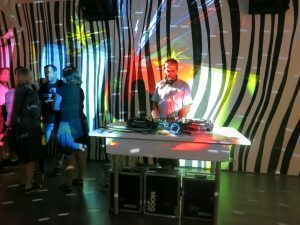 Guest DJs performed every Friday evenings during the event. 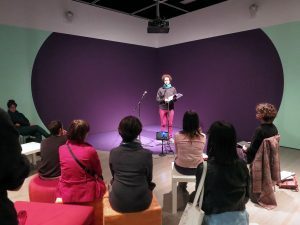 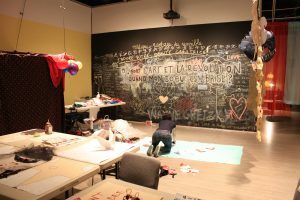 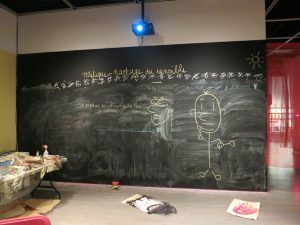 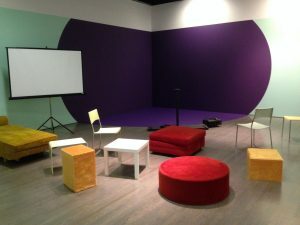 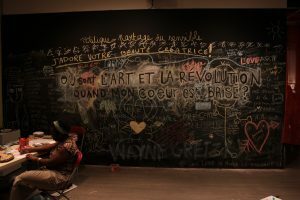 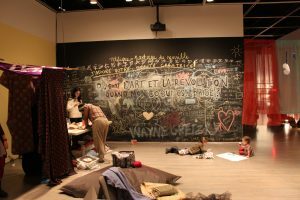 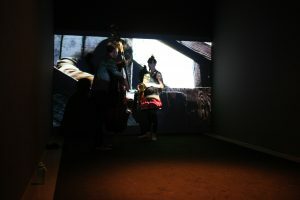 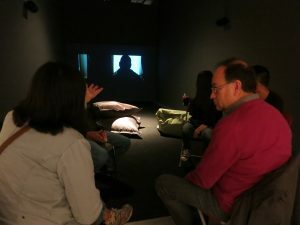 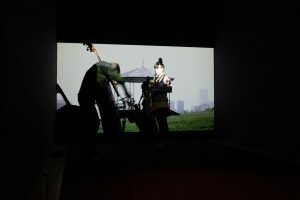 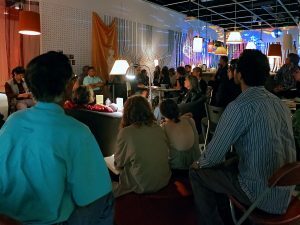 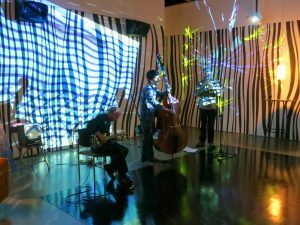 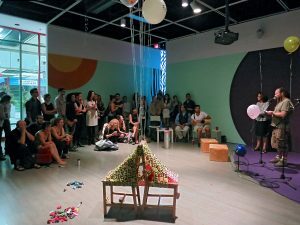 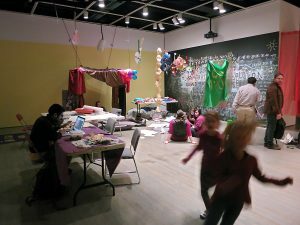 The objective was to enable the public to experience the findings of our research, reflecting upon the role of ethnicities in the construction of identity in Quebec and the role of the artist as a social actor as well as the state’s role in art, through a meeting place that encouraged dialogue and collective creation. 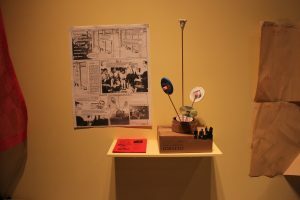 The project aimed for reviving the will to integrate art into society that was so prevalent in the 1970s. 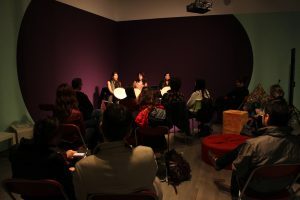 A website in collaboration with the art historian Francine Couture documented the whole event. 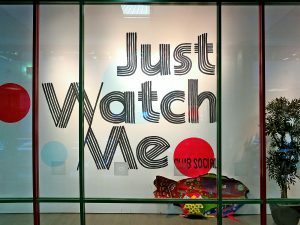 Just Watch Me provided a disco-café hosting a weekly disco night, a fair-trade café, fitness courses, and numerous other activities for the body and the mind. 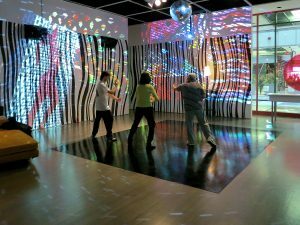 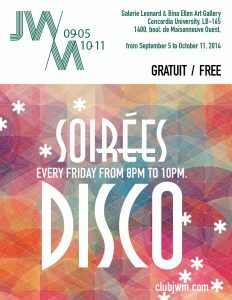 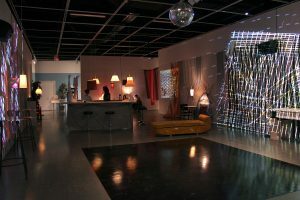 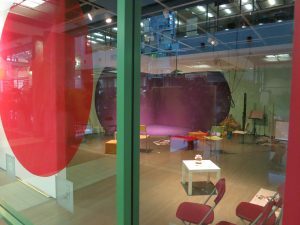 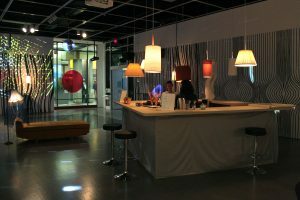 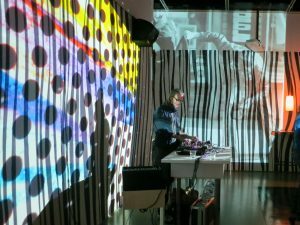 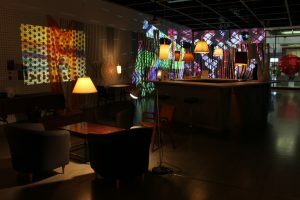 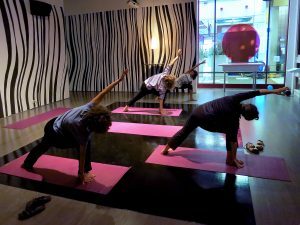 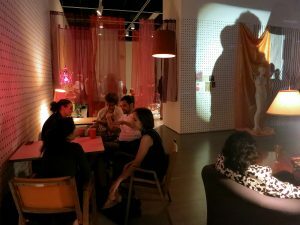 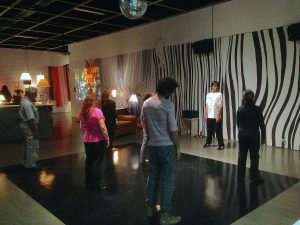 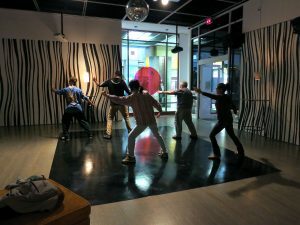 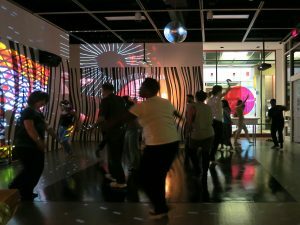 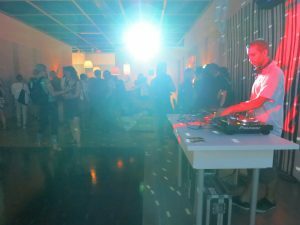 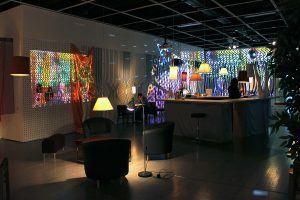 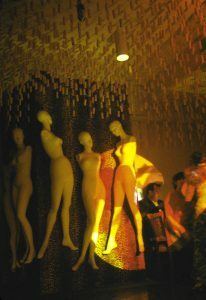 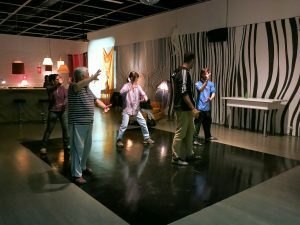 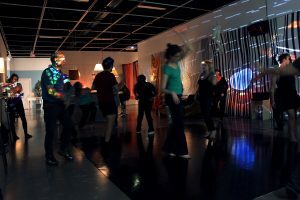 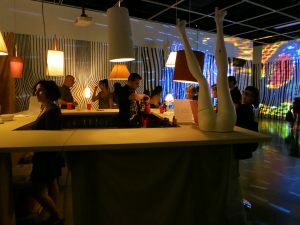 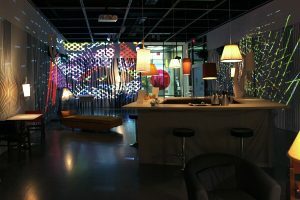 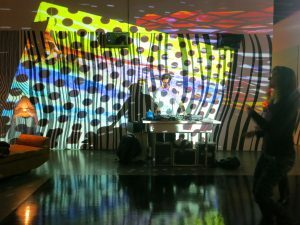 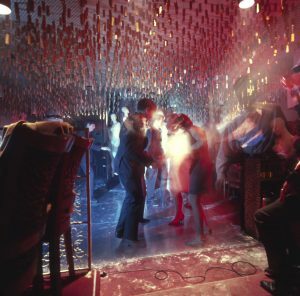 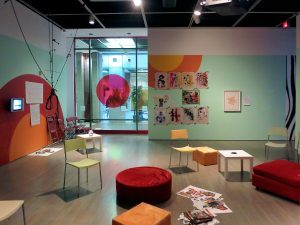 The space is inspired by Jean-Paul Mousseau’s Mousse Spacthèque disco, made in 1966 in Montreal. 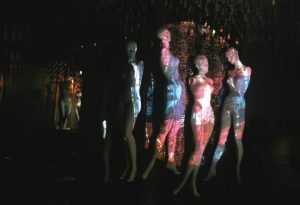 Research and design in collaboration with the art historian Francine Couture. 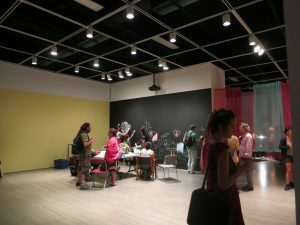 Art Studio / Fusions des Arts inc.
Just Watch Me offered an artist’s residency to two socially engaged artists, inspired by the activities of Fusions des Arts inc., a not-for-profit company active from 1965 to 1969 that used art to contribute to individual as well as collective liberation in a revolutionary perspective. 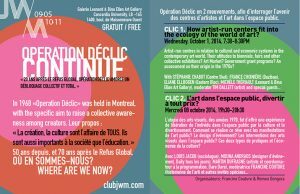 Research and design in collaboration with the art historian Ève Lamoureux. 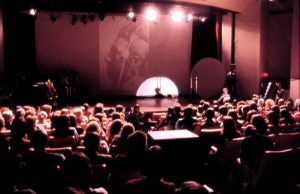 Movie Theater / Fusions des Arts inc.
Just Watch Me contained a movie theater with a program that meant to reflect on identity issues in Quebec. 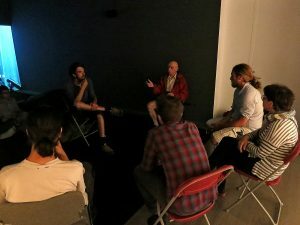 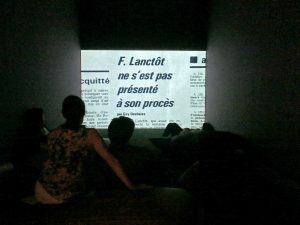 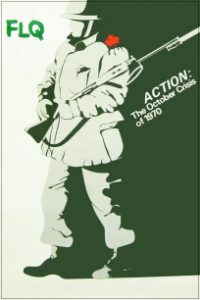 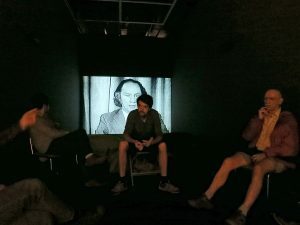 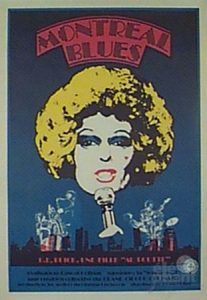 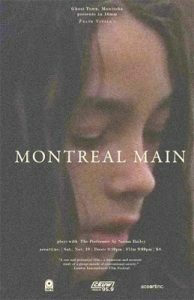 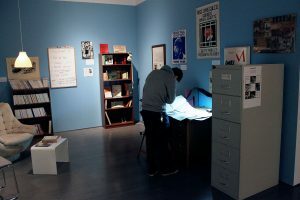 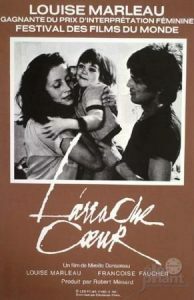 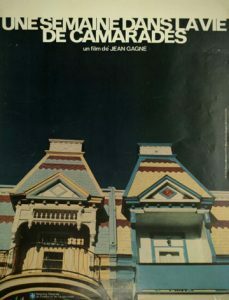 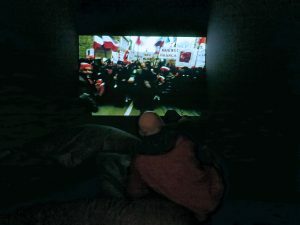 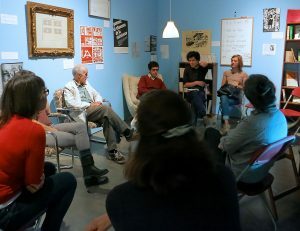 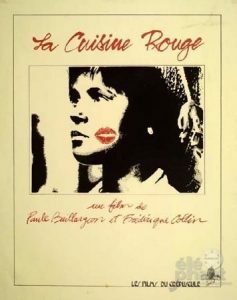 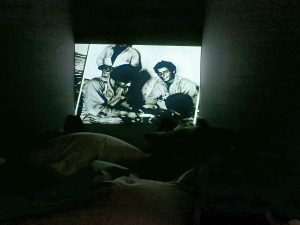 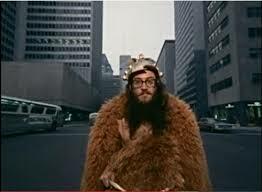 The film program was inspired by La Semaine d’information politique, a film program organized in 1968 by the collective Fusion des Arts inc., active in Montreal in the late 1960s. 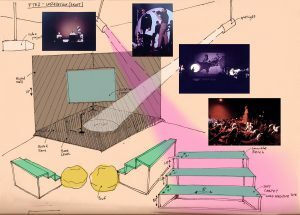 Research and design in collaboration with the film theorist Kester Dyer. 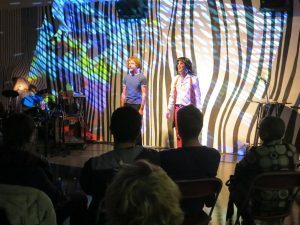 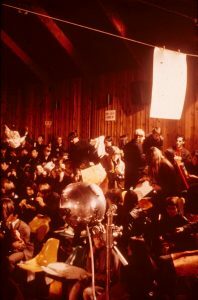 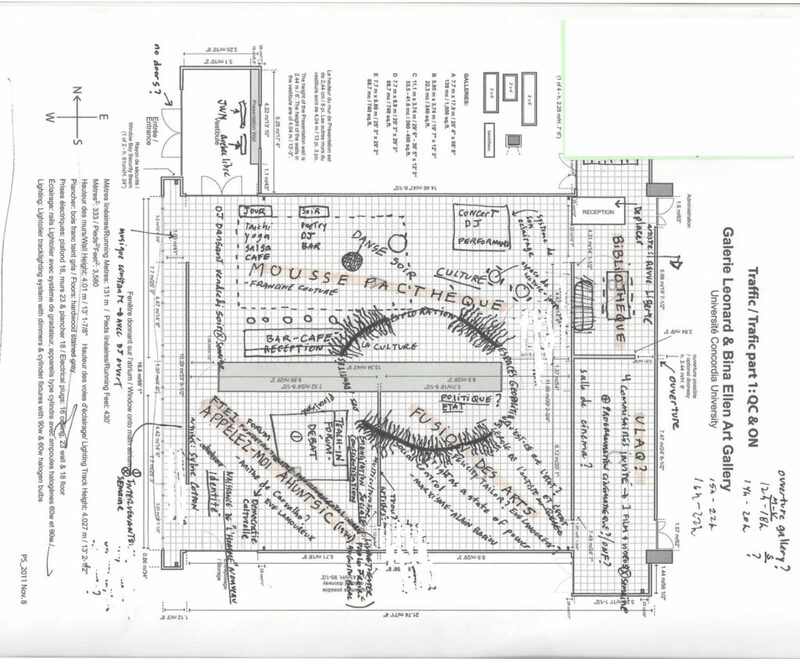 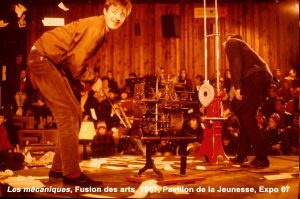 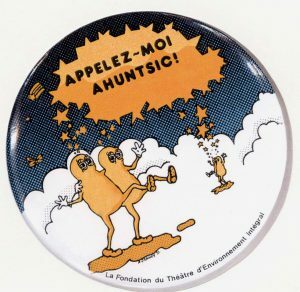 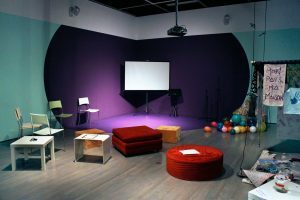 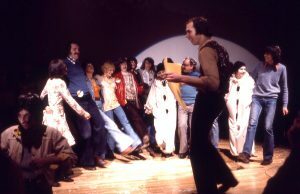 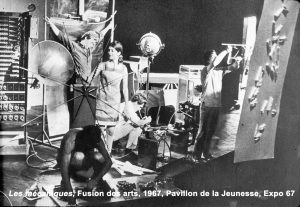 The stage space of Just Watch Me event was inspired by Maurice Demers’ participatory environment Appelez-moi Ahuntsic in 1974. 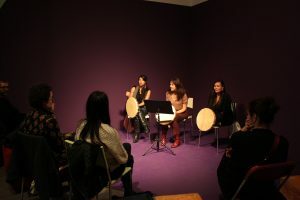 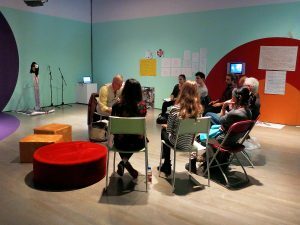 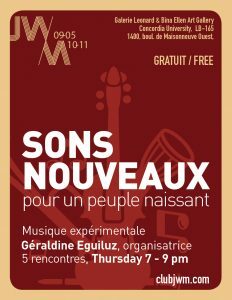 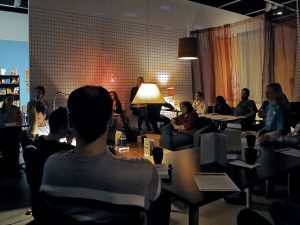 Poetry evenings, musical concerts, video workshops and thematic meetings on Quebec identities were presented during the one day event. 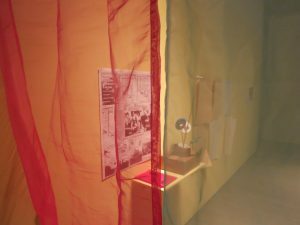 Research and design in collaboration with the art historian Anithe de Carvalho. 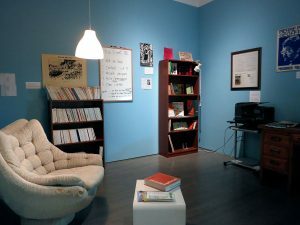 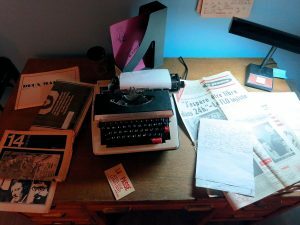 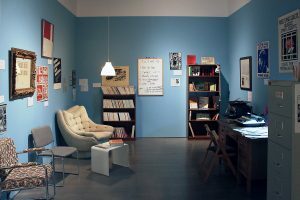 Just Watch Me had a library and a working space inspired on small groups of intellectuals leftists in Montreal associated to the newspaper Partis Pris and Liberté in the late 1960s. 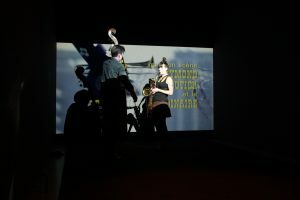 Research, design and equipped in collaboration with the Médiathèque littéraire Gaëtan-Dostie, the collectif Anarchives and Liberté. 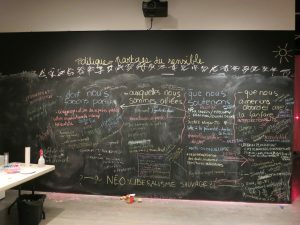 The project was initiated by Romeo Gongora and organized with Anithe de Carvalho, Francine Couture, CUTV, Kester Dyer, Les Éditions de la Tournure, Géraldine Eguiluz, Les Filles électriques, Ève Lamoureux, La Médiathèque littéraire Gaëtan Dostie, Felicity Tayler, University of the Streets Café and many others. 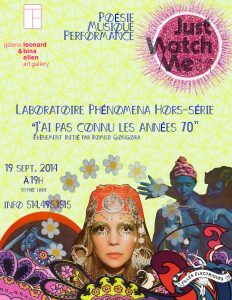 Just Watch Me was produced and presented by Leonard & Bina Ellen Art Gallery in Montreal (CA). 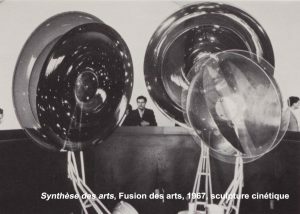 With the support of the Canada Council for the Arts and the contribution of MOOG Audio. 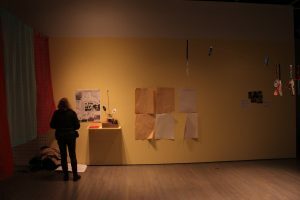 Romeo Gongora is a Canadian-Guatemalan visual artist and PhD researcher in Fine Art at Goldsmiths, University of London (UK). 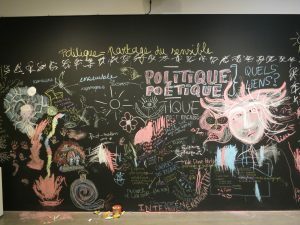 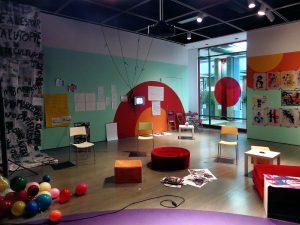 Since 2008, he has conducted major collaborative projects that interact with the social sphere, integrating politics and pedagogy in the practice of performance. 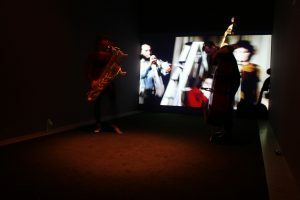 He is the recipient of several grants and has shown his work at, amongst others, the Musée d’art contemporain de Montréal (Canada), HISK (Belgium), Centre of Art Torun (Poland), Centre Makan (Jordan) and Leonard&Bina Ellen Gallery (Canada). 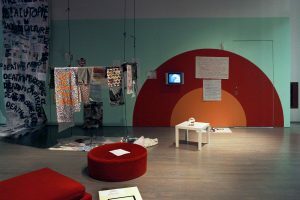 He has been an artist-in-residence at, among others, the Rijksakademie (Netherlands, 2007-08), the Künstlerhaus Bethanien (Germany, 2009) and Acme Studios (UK, 2016). 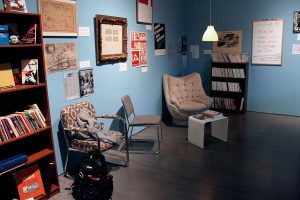 Laznia Center of Contemporary Art publisher (PL), 132 p.
2009 Gallery 44, ‘Expanded Photography’, Marie Fraser, 145 p.
Elizabeth Matheson and Nancy Tousley, 154 p..
2008 Musée d’art contemporain de Montréal, ‘The Quebec Triennial: Nothing is lost…’, 220 p.
I consider myself a researcher, my purpose is not an art object, but a research project that materializes in a transdisciplinary manner (installations, performance, photography, collaboration, meeting, writing, etc..). 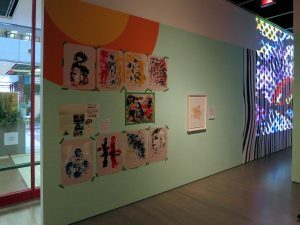 This emphasis on the process/experience rather than the final product. 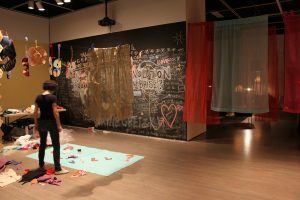 My work use dialogue, empathy and trust as a production strategy. 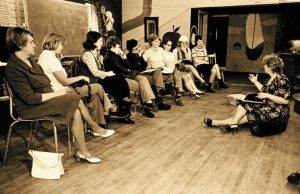 This procedure usually involves a period of research in which I collaborate closely with different communities. 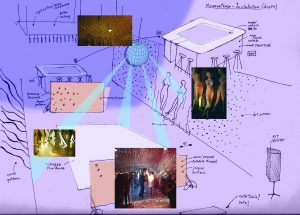 The result is a collaborative work with a deep emotional intensity that aims to analyze the socio-psychological constructs of an environment. 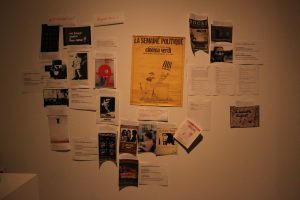 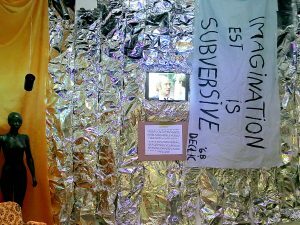 Since 2008, I have conducted major projects collectively that have acquired a social dimension, integrating politics, activism and marginality in the practice of performance. 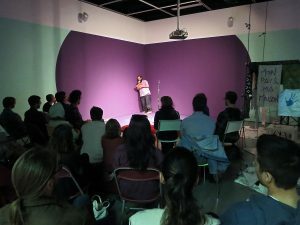 Such as Movimiento Social del Cuerpo, a series of laboratories in collaboration with Latin American universities (Bogotá, Lima, Cordoba, Goiania, etc.) 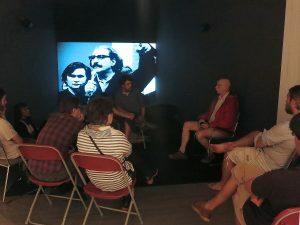 inspired by Paulo Freire, Augusto Boal and Orlando Fals Borda, on social and political questions. 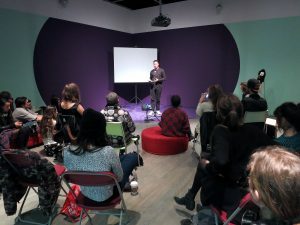 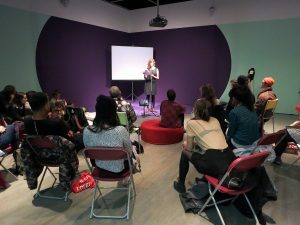 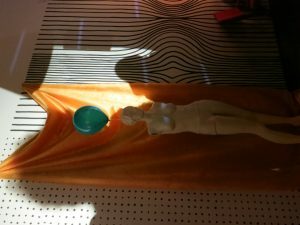 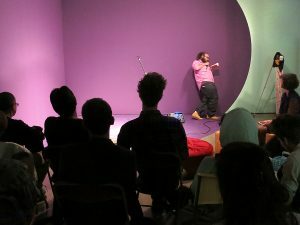 In 2014, I started the project Just watch me, event, social club, meeting space focused on dialogue and collective creation, presented at the Leonard & Bina Ellen Art Gallery in Montreal.